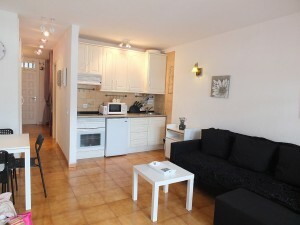 These apartments to rent on Parque Royal Tenerife are very close to the beach. This particular apartment has been recently refurbished. One of our apartments to rent on Parque Royal Tenerife, which has been recently refurbished with new furniture, including an L-shaped sofa bed in the lounge. The kitchen is well equipped with all the usual appliances, including a coffee maker, which is a nice touch. The terrace is furnished with a patio table and chairs and enjoys a sea and pool view. The bathroom has a shower cubicle and the washing machine is also located here. In the bedroom there are 2 single beds and a ceiling fan above. La Gomera is the 2nd smallest island on the Canary Islands. It has a population of 24,000 people. 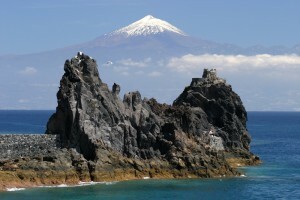 The capital on the island is San Sebastian de La Gomera. It is also known as the Columbian island, because the explorer Christopher Columbus one stopped here for supplies. Like Tenerife the Southern part of the island is known for it’s warmer weather. It reaches an average temperature of 22 degrees C all year round. Since 1445 La Gomera was governed by Hernan Peraza I. His son Hernan Peraza the Younger was very cruel to the islanders, the Aborigines of La Gomera. Because of this there was a revolt, resulting in the violent death of Hernan Peraza the Younger. His wife Beatriz de Bobadilla, with the help of Pedro de Vera (Conquerer of Gran Canaria), put an end to the revolt, but she was also very cruel. She was married later to another important personality in the conquest of the Canaries, Alonso Fernández de Lugo. She also received Christopher Columbus on some of his visits to the island. She died in the court of Madrid in 1504. In the 16th century, the island was attached by Dutch and British pirates. The worst of these raids was that of the Berbers which swept across the island.